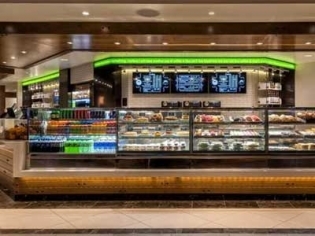 Nook Express is a grab and go counter that serves an assortment of coffees, teas, mouth-watering pastries, sandwiches, breakfast items and small bites that are sure to please you any time of day or night. For your sweet tooth, there is soft serve in addition to the pastries. There are also fresh salads to eat as a meal or on the side. Enjoy the excellent cold brew coffee to perk up your day! The service is quick and friendly and location is very convenient. Stop by after 8 pm and you might find a great deal on those mouth watering pastries!